(S0703)﻿ I was a little let down by this episode, if only because I was completely misled by the crow marionettes chirping “redrum” overtop of the opening credits. Where I was expecting excitement I was met with predictability. Not to say that this was a bad episode, but I am a little loathe to see the big "bag of boom" trade hands for old storylines. So even though Nancy was being dragged off to a drug test at the end of the last episode – and even though she tested positive on said test – it appears as though Counsellor Ed has pulled some strings and gotten Momma Botwin into drug class. Ironically, “drug class” turns out to be more instructional than rehabilitative. Shelby, the drug counsellor, first appears to be as tough as nails, having done time for possession and trafficking. Her experiences, however, inadvertently feed Nancy’s need for narcotic news, which she’ll later regurgitate to Andy for further investigation. Speaking of whom, Andy and his nephews are planning out their day while they wait to visit Nancy; Shane is helping house-hunt, and Silas is looking for work. Silas once again exempts himself from visiting Nancy. After discovering that she lied about his father, who can blame him? Instead, he heads to his job interview with Maxine (Lindsay Sloane), an artist who “chooses to not participate in the commodification of her persona” – in other words, someone else pretends to be her in public. 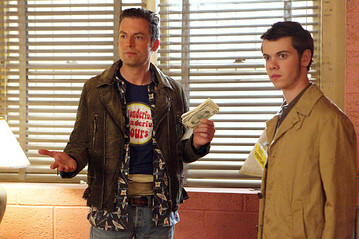 Thankfully for Silas, he’s both a Botwin and a Gunnard, which is just enough bizarre to land the job with Maxine. The job, which is more of a stunt as it turns out, involves walking around a gallery full of people while inside a clear inflatable ball, wearing nothing but his tighty-whities. What Silas doesn’t know, is that he cannot breathe inside the ball, and starts suffocating in front of the entire crowd. Maxine, afterwards claiming that she can re-inflate the ball, leaves the struggling Silas to be cut free by the some-witted Andy, who is apparently the only person in over 100 performances to do so. Not appreciating being lied to, Silas gets his money and heads home where he gets his face-to-face with Nancy in the episode’s final minutes. This episode was largely about Nancy finally rekindling individual relationships within her family. Even though she wasn’t ready to see anyone, she’s forced to deal with it when she learns that her family is back to stay. To a certain degree, everyone seems ready and willing to regress the three years that we skipped and fall right back into a semblance of their old habits. Shane is the first: after sharing the details of his brief career as a puppeteer, he seems all too ready to pass control of the strings back to Nancy, who no sooner demands four years of college out of him before cutting her reunion short to go speak with her sister. While Andy and Shane secure a not-so-secure looking apartment from a failed nightclub owner, Nancy is able to keep a hook in her sister’s mouth long enough to learn that she and her husband are filing for custody of Stevie. This emotional explosion is enough motivation for Nancy to put her sad-eyes and vulnerable ramblings into high-gear. Apparently after three years in jail Nancy has discovered that she can have the same effect on women as she does on men -- Shelby grants Nancy an excessive four hours with which she is supposed to find a job. Shane takes his mother’s “advice” and applies to college, only to discover that he has a better chance at admission if he uses his Icelandic passport. He’s also handed a stack of loan applications, because apparently foreign students don’t get any scholarships and have to pay higher tuition. We last see Shane visiting each of these banks, apparently testing the loan waters for... well, I couldn’t tell you. Tuition? Anticlimactic. Repairs for the apartment? Predictable. Look at that smug smirk, and tell me something genius isn’t about to happen? While Shane is out, Nancy stops by the apartment and gets her two minutes with Andy. Even though Nancy is peeing in the corner and it’s totally awkward, it’s what makes the moments between Andy and Nancy that much more genuine. We see that Nancy still has her anchor dropped somewhere in Andy’s heart, even if he won’t admit it. Not only does he go on a scavenger hunt for whispers and rumours from Nancy’s “drug class,” but he hangs on to her big bag of boom while she keeps up appearances at job interviews. She returns briefly to grab the explosives and change clothes for what Andy immediately recognizes as one of Nancy’s naughty rendezvous. She soon meets up with Dmitri (Pablo Schreiber), also known as the Sarge and sometimes mistaken for his sister Zoya, who makes the trade for the explosives. While Andy is off having his higher self probed by Maxine after Silas’ show – there are far too many euphemisms that I don’t even want to try tackle in that one – Silas returns home to find Nancy hiding her new stereo stash in their apartment. Silas foregoes any opportunity to make Nancy actually realize how much she hurt him, and offers her a deal: since she can’t sell from the halfway house, he will run the business he was “born and raised to do” for 50%. She has no choice but to accept, giving Silas the satisfaction he searched for in season 2 when he first asked to help out with dealing. I left Doug for last this week because it seems like he’s actually getting a storyline of his own, and this is certainly cause for celebration! Dressed in a jacket that looks like Cheetoh-coloured velvet, Doug looks more like a rusty rocket than a “Rocket Man.” He’s welcomed in to the Vehement building with a partial-standing ovation, being spoon-fed compliments the entire time while he’s shown his own brand new office. As it happens, Vehement needs a new accountant, and we all know what type of accounting Doug specializes in. So what exactly do Doug’s old college buddies do? We don’t know more than Doug, but I think it’s safe to say that it may involve laundering, especially since someone else is looking into getting Doug some sketchy certification. In a room full of black suits, I don’t like the way that Doug sticks out like a clown’s sore thumb; even though he specializes in questionable accounting practices, he did end up losing everything and becoming a story-parasite for 3 seasons. Maybe he’ll find some assistance from Shane, who may or may not be coming up with a sizeable amount of loan money next week. I’m hoping that this week’s predictability was only a result of the pieces that have been set up over the last two weeks. It was clear that it hadn’t clicked in Nancy’s mind why her son called her “Aunt Nancy,” making another video chat with her sister, Jill Price-Grey, dreadfully unavoidable. I need to take a moment and compliment the writers; out of the two sisters, the promiscuous, lying, cheating, drug-dealing, emotionally-unstable sister comes off as more sane/lucid/rational than the domestic housewife who has never been to jail. Keep an eye out for Martin Short on next week’s episode – it’s bound to lace the show with enough laughs and more to make up for the shortage this week. It's a good point Mark that this episode was somewhat disappointing after an initial two episodes that showed some promise for Weeds to break out of the rut/bad decisions of recent years. I didn't realize that "red rum" was dropped during the title card sequence, wow !